This analysis is brought to you from the "Eagle Eye", a US classics specialist from the SCADS team. THIS SAYS::: nothing.....Take a look at the scan. What you see is what you get. This is a handed down collection comprising of (sic) over 20 boxes. Whenever there are notations on the envelopes they will be given. Some stamps have notations on the back. Wether (sic) these notations are correct or not is your obligation to determine. The front and back of the stamps are scanned in an aid to identification. No scans have been manipulated. "....... the high bidder had second thoughts, as he should have. I cancelled his sale......"
However, this statement cannot be confirmed. Both buyer and seller have left positive feedback for the transaction. This lot contains added artwork in a similar style to a lot bought by "chickfrdstk" on 9 Feb 2002 as item 1330614789 as a #7 which was altered and sold "as is" as a #5 and sold by "schuylerac" on 4 Apr 2002. This is shown in this comparison. It was sold to the reseller "ahneve", who offered it "as is" on 4 May 2002 for $9.99 as item 1350905147, but ended the auction just before it closed due to lack of significant bids. As a specialist of this issue, my assessment of this stamp as it is pictured is that it is an "impossibility." The stamp shows a complete design at top and bottom, to include the all-important complete "balls" under the inner scrolls. 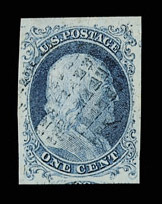 The only imperforate US stamp that has these features is the famous and rare Scott #5 ($45,000). 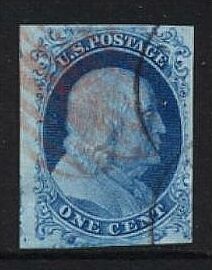 The problem with this fake is that the stamp has a blue guide dot at lower left (near the adjoining stamp). These guide dots were intentionally placed on the plate to help align the transfer rolls. The trouble is, Scott #5 came from the top row of plate 1e (position 7R1e, ref Scott), and there were no guide dots placed at the bottom of the stamps on the top row of these plates. The guide dots were only placed at the bottom of the 3d, 5th, 7th, and 9th rows. 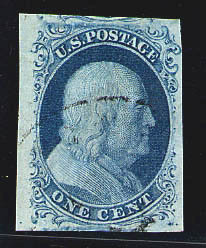 In addition, guide dots were placed at the TOP of the stamps on the TOP row only. Since Scott #5 came from only one plate position (a top row position), the plate marks of the design should look the same on all copies. The stamp retouched to look like a #5 shows no guide dot where there definitely should be one. The guide dot is clearly visible at top right in the image of a true #5 (shown at left). At left is an image of a Scott #7 better showing the bottom guide dots (the example shows one at bottom left as well as one at bottom right). Also, Scott #5 had a clear impression, which can be easily seen in the example (at left) of the true #5 (note guide dot at top right). 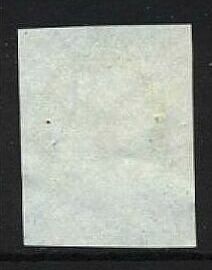 A comparison with the above #7 and "pcheltenham"'s stamp will show ink "clouds" that are common to Scott #7.